Wohi asli mein jiyaa karte hain"
We will always miss you, Ishmeet. We are friends and fans of Ishmeet and demand a high level inquiry into his death. We also feel that Ishmeet deserved much more than that offered by the STAR GROUP in his memory. November 24th - Ishmeet won VOI title! "Time is a companion that goes with us on a journey. It reminds us to cherish each moment, because it will never come again. What we leave behind is not as important as how we have lived. " It was on November 24th, 2007 when Ishmeet won his title of the VOI. It is really hard to believe that he is not among us. But surely has left a legacy behind him of his good deeds. His life is a motivation for many. It seems as if it was yesterday when we all were voting enthusiastically for Ishmeet but today we just have his memories. How difficult it is for Ishmeet's family to cope up with this loss. It is hard to imagine their thoughts on November 24th, 2008. We just pray to almighty Waheguru to bless Ishmeet and his family. Ishmeet we miss you a lot!! Wish you could come back but again Almighty Lord has his own way of doing things. To identify, support & promote talented youth in the curricular and co-curricular activities. To fulfill the ideals depicted by the persona and values of Ishmeet Singh. To work for the social, cultural, intellectual and spiritual uplift of humanity irrespective of caste, color, creed, region or religion. All other acts, deeds & things of welfare and charitable character necessary and incidental to fulfill the aims & objectives of the Foundation. Please support the cause by joining the foundation and supporting Justice for Ishmeet campaign. Justice for Ishmeet campaign team is planning to organize a memorial service for Ishmeet Singh in Delhi. This will help us to pay our respect, love, and appreciation for the star who has made us all proud. We have not decided any date yet but it has to be sometime in November. We are looking for some volunteers to help us organize this event. Please contact us at justice_for_ishmeet@yahoo.com and we will provide you more details about it. Ishmeet Singh's first and last playback in a movie titled “Sat Sri Akal” was released a few days ago. A link to it’s “you tube video” is added in the blog. 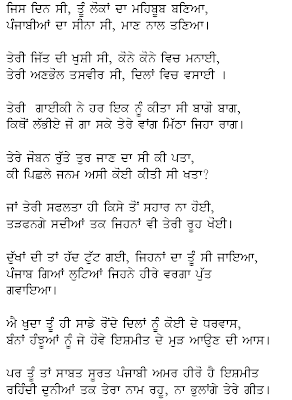 Also, you will find this Shabad playing in the background of this blog. Please note that the Shabad is being played only for its promotional purposes. We encourage you to buy a original CD of the album. By this way you will make Ishmeet a part of your life and can cherish his soulful voice forever. Ishmeet Got Threatening SMS- Questions to answer!! Ishmeet’s family held a press conference where they provided details about their findings in the Maldives. To everyone’s surprise they have revealed that Ishmeet in fact got a threatening SMS a week before his death. The SMS was from some girl named Richa who is unknown to the family. The message read “Gud mng. Ek baat batao tmhe sharam nahi aati hai. No. dekh ke kaat dete ho. Aisa kyo krte ho tum. VOI bn ne ka itna ghamand mat kro ye jyada din tak nhi rhega” Interestingly the phone number was saved by the name of “Richa H cousin”. She seems like a cousin of someone whose name starts with H.
Family further conveyed their apprehension about the intentions of Sanjit Shah from Star Plus and Hassan Ishaan, a local organizer in the Maldives. It certainly seems fishy on part of the profit oriented company to bear extra expense of taking Ishmeet and then putting him in a resort four days prior to the show. It will worth mentioning here that Ishmeet’s peers Harshit Saxena and Abhas Joshi were also scheduled to perform in the same event but could not join Ishmeet because of their prior commitments. Then why Ishmeet was not told to accompany both Harshit and Abhas rather than flying before? If we have to believe The Tribune, actually the show was scheduled in the very same resort, secluded from rest of the world in no mans land. It seems like the company was planning on ferrying the audience from Male to the resort on the boats (as the only way to reach that resort is by boat). Family also found that the statements given by Vyom , Arunima, Sanjit Shah, and Hassan Ishaan to the Indian high commission and Maldives Police are in contradiction to each other. 1. How can a 5ft 11 inch strong guy drown in the pool without any effort? 2. What about the blood clot and linear cut on Ishmeet’s body? 3. Why Ishmeet was wearing the same clothes in which he was last seen at the Maldives airport? 4. Why Vyom, Arunima, Sanjit Shah, and Hassan Ishaan gave contradicting statements to the Indian high commission and the Madives police? 5. Why emphasis was given on Ishmeet’s negligence in Vyom’s statement? 6. Why a secluded resort in no mans land was chosen for Ishmeet’s stay and the show? 7. Why resort was not informed about the celebrity status of Ishmeet so some security could have been provided? 8. Why Ishmeet was brought in Maldives 4 days prior to the show? 9. Why no body from the resort staff of 250 people saw Vyom and Arunima with Ishmeet at the pool? 10. Why Vyom couldn’t see Ishmeet struggling in the clear blue water of the pool? 11. Why didn’t the resort doctor, who was playing badminton just 15 seconds away from the pool, reach on time to save Ishmeet? 12. Who is this Richa, H’s cousin, who sent a threatening SMS to Ishmeet? We don’t have an iota of doubt about the deliberate errors committed by the Star Group and the local organizing company. Come on wake up authorities, you don’t need Scotland Yard or FBI to crack this case. Ishmeet’s family has returned from Maldives with some startling facts. Upon inspecting every nook and corner of the resort and talking with the resort staff, they found that not a single staff member (out of 250) saw Ishmeet with Vyom and Arunima (eyewitnesses) in the pool. His family is convinced that there is no way Ishmeet could have got those injury marks on his forehead in the swimming pool which was just 92 inches (7.6 ft) deep. Another fact which came to forth was the presence of pool attendant up till 4:50 pm on the fateful day. The attendant’s claim of not seeing Ishmeet till 4:50 pm certainly point fingers towards the statements made by the eyewitnesses. If we have to believe the eyewitnesses who called for the help, there has to be someone in the resort confirming Arunima and Vyom’s presence in the pool. We completely agree with Dr. C K Singh who has mentioned these eyewitnesses as self styled. Indeed these witnesses need to be interrogated in a formal way to get out the truth. A press conference shall be held in the coming days where family will present the proof and evidence gathered by them in the Maldives which strongly suggest a conspiracy in Ishmeet’s death. Ishmeet’s father Gurpinder Singh along with his uncle Dr. C K Singh has already apprised the Prime Minister of India of their findings in the Maldives. They have been assured by the Prime Minister of all possible help. In this regard, family will submit a formal written request for the CBI inquiry in the coming days. Also, a website for Ishmeet Singh is coming up in the next few days. The website being created by his cousins and friends will share Ishmeet’s journey of life. Along that the website will also host some videos/pictures and other facts from Maldives to aware people about a strong possibility of a foul play in to his death. Please spread the word about this campaign we are running here. It is very important for more and more people to know what is being done in Ishmeet’s case. Subscribe To Justice For Ishmeet Blog!